Toe amputation is a common procedure performed by a wide variety of healthcare providers. The vast majority of toe amputations are performed on patients with a diabetic foot. Although regional variation is noted, most of these procedures are done by general, vascular, and orthopedic surgeons (particularly those subspecializing in foot and ankle surgery); in some countries, podiatrists are involved. Before any amputation, the clinician should ensure that the patient’s medical circumstances have been optimized (ie, should "reverse the reversible"). With impending toe amputation, this step encompasses such measures as glycemic control and consideration of revascularization when severe macrovascular disease is contributing to ischemia. A “dead” toe is one in which the blood supply is so completely impeded that infarction and necrosis develop (see the images below). Infarction results in dry gangrene, with nonviable tissue becoming dry and black in color (because of the presence of iron sulfide, a product of the hemoglobin released by lysed erythrocytes). Gangrenous fifth toe. Dubious perfusion in fourth toe. Lateral two toes for amputation (lateral view). In Western societies, a “dead” toe is most commonly seen as a complication of diabetes mellitus and is due to a combination of macrovascular and microvascular disease. Other major risk factors for peripheral vascular disease (as for all atherosclerotic diseases) include smoking, hypertension, and hyperlipidemia. Rarely, pathologic processes confined to the microvasculature are to blame (eg, thromboangiitis obliterans [Buerger disease], vasospastic diseases, severe frostbite). The “deadly” category generally refers to a more proximal disease processe that can result in systemic sequelae. For example, a large limb segment affected by wet gangrene (with macroscopic putrefaction and surrounding cellulitis) can be deadly if not addressed urgently. Malignancy may also necessitate amputation, though infrequently. A toe is a “dead loss” when it is diseased to the point where it is irreparable (as with chronic osteomyelitis), it ceases to be functional (as with significant trauma), or it is impeding function (as with neuropathic pain). The main contraindication for toe amputation is poor demarcation of infarcted tissue (patchy gangrene). If the borders of the infarcted area are unclear, the surgeon cannot know the true extent of the disease and hence cannot be certain of amputating to a region of adequate blood supply. More broadly, amputation of any body part is contraindicated when it will result in a reduced quality of life in the setting of a limited life expectancy. However, this contraindication is not usually relevant to toe amputation. The phalanges of the foot correspond, in number and general arrangement, with those of the hand; two are found in the great toe, and three are found in each of the other toes. However, the phalanges of the foot differ from the phalanges of the hand in terms of size, with the bodies of the phalanges of the foot being much reduced in length and, especially in the first row, laterally compressed. The body of each proximal phalanx is similar to the metatarsals in being convex above and concave below. The base is concave for articulation with the respective metatarsal, and the head presents a trochlear surface for articulation with the second phalanx. For more information about the relevant anatomy, see Foot Bone Anatomy. Frykberg RG, Zgonis T, Armstrong DG, Driver VR, Giurini JM, Kravitz SR, et al. Diabetic foot disorders. A clinical practice guideline (2006 revision). J Foot Ankle Surg. 2006 Sep-Oct. 45 (5 Suppl):S1-66. [Medline]. Sayers R, Davies RSM. Arterial disorders. Williams NS, O'Connell RP, McCaskie AW, eds. Bailey and Love's Short Practice of Surgery. 27th ed. Boca Raton, FL: CRC Press; 2018. 942-68. Mann RA, Poppen NK, O'Konski M. Amputation of the great toe. A clinical and biomechanical study. Clin Orthop Relat Res. 1988 Jan. 192-205. [Medline]. Poppen NK, Mann RA, O'Konski M, Buncke HJ. Amputation of the great toe. Foot Ankle. 1981 May. 1 (6):333-7. [Medline]. Kim J, Park JW, Hong SW, Jeong JY, Gong HS, Baek GH. Ray amputation for the treatment of foot macrodactyly in children. Bone Joint J. 2015 Oct. 97-B (10):1364-9. [Medline]. Stone PA, Glomski A, Thompson SN, Adams E. Toe Pressures are Superior to Duplex Parameters in Predicting Wound Healing following Toe and Foot Amputations. Ann Vasc Surg. 2018 Jan. 46:147-154. [Medline]. Barták V, Hromádka R, Fulín P, Jahoda D, Sosna A, Popelka S. [Anatomical study of flexor hallucis brevis insertion: Implications for clinical practice]. Acta Chir Orthop Traumatol Cech. 2011. 78 (2):145-8. [Medline]. Anderson RC, Nanos GP III, Pinzur MS, Potter BK. Amputations in trauma. Browner BD, Jupiter JB, Krettek C, Anderson PA, eds. Skeletal Trauma: Basic Science, Management, and Reconstruction. 5th ed. Philadelphia: Elsevier Saunders; 2015. Vol 2: 2513. Wagner FW. Partial-foot amputations: surgical procedures. Bowker MJ, Michael JW, eds. Atlas of Limb Prosthetics: Surgical, Prosthetic, and Rehabilitation Principles. Rosemont, IL: American Academy of Orthopedic Surgeons; 2002. Ecker ML, Jacobs BS. Lower extremity amputation in diabetic patients. Diabetes. 1970 Mar. 19 (3):189-95. [Medline]. McKittrick LS, McKittrick JB, Risley TS. 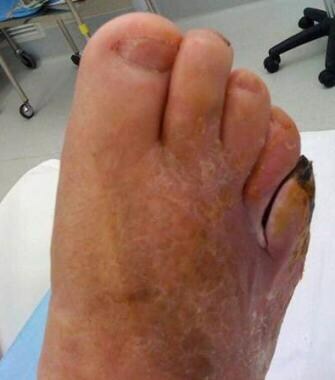 Transmetatarsal Amputation for Infection or Gangrene in Patients with Diabetes Mellitus. Ann Surg. 1949 Oct. 130 (4):826-40. [Medline]. [Full Text]. Mahmood A, Maffulli N. Acute repairs of the Achilles tendon by the percutaneous technique. Nunley JA, ed. The Achilles Tendon: Treatment and Rehabilitation. New York: Springer; 2009. 55-66. Elsherif M, Tawfick W, Canning P, Hynes N, Sultan S. Quality of time spent without symptoms of disease or toxicity of treatment for transmetatarsal amputation versus digital amputation in diabetic patients with digital gangrene. Vascular. 2018 Apr. 26 (2):142-150. [Medline]. Gorjanc J, Morrison SA, Blagus R, Mekjavic IB. Cold Susceptibility of Digit Stumps Resulting from Amputation After Freezing Cold Injury in Elite Alpinists. High Alt Med Biol. 2018 Jun. 19 (2):185-192. [Medline]. Markup for second-toe amputation (fish-mouth skin excision): anterior view of (dry) gangrenous toe. Markup for second-toe amputation: posterior view. Toe excised. Note shiny cartilage cap on metatarsal head. Dressing suggestion: wound packed with calcium-alginate dressing, paraffin gauze on top (crepe bandage to finish). Adjacent toe amputations: anterior view of markup. Lateral two toes amputated. Note alternative technique used here. Single larger wound is made rather than two smaller fish-mouth wounds; this is because skin bridge between toes was unlikely to have adequate perfusion. Amputation of adjacent toes at metatarsophalangeal joint using fish-mouth incisions. The authors gratefully acknowledge the contributions of the following staff from the Princess Alexandra Hospital, Queensland, Australia: Dr Peter Hansen, Senior Registrar in Vascular Surgery, and Dr Danny Hagley, Registrar in General Surgery, for images and video; and Dr Michael Lutz, Consultant Orthopaedic Surgeon, Foot and Ankle, and Dr Stephen Gett, Consultant Vascular Surgeon, for their helpful suggestions regarding the manuscript. Lower-Extremity Amputations in Diabetes Are Back on the Rise, but Why?